I discovered the Baby Oil range from Rustic Art quite a while ago, but I got about buying it very recently at the Beaute Naturelle store that was recently launched in Pune. Megs, the owner of the store also has her presence online at Naturelle. I picked up quite a few things at her store. Rustic Art Baby soaps that I have reviewed here, which was again bought from her stall at the Flea Market at Ishanya, the laundry detergent from Rustic Art, the Green Apple Baby oil and the Natural Beeswax Handcream by Mountain Bounties. 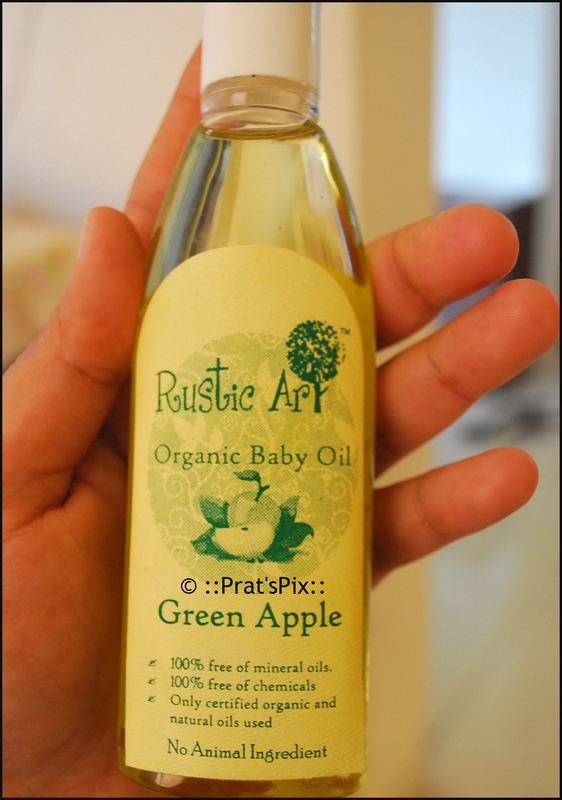 Today I am going to review the Green Apple Baby oil by Rustic Art. I’m a fan of Rustic Art ever since I got introduced to their products. I’ve tried most of their soaps for myself and I ensure that I purchase their Baby Soap for my kids too. I had not explored the Baby oil range and I decided to purchase this. I must say that I was not disappointed. 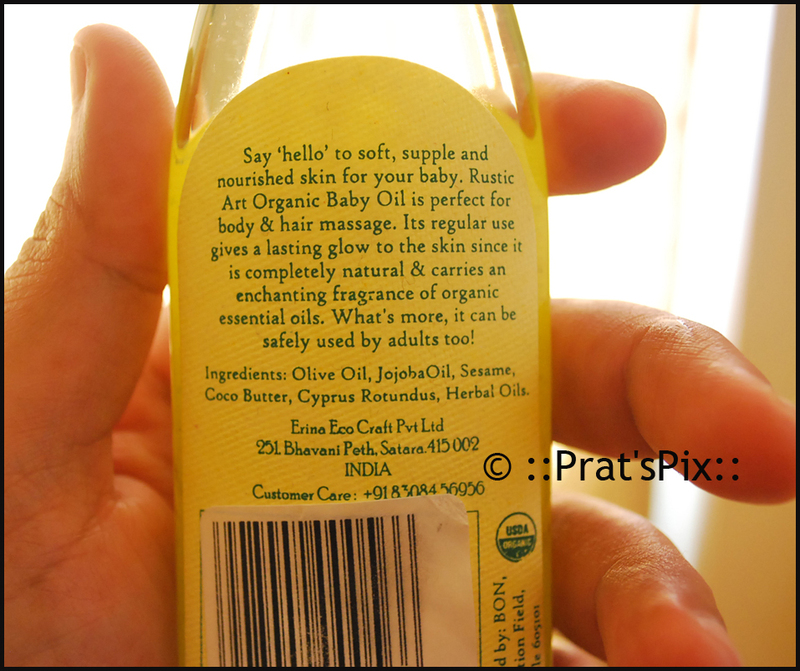 There are two variants in this oil – Evoke and the Green Apple Baby Oil. I am yet to try the former, I chose the green apple variant because I love the faint green apple fragrance that lingers on long after it has been used. After an exhausting day, I find the fragrance absolutely relaxing when I massage the tired legs of my boys. No, this oil does not have relaxing qualities, I did check with one of the founders, but the fragrance is soothing enough to relax your little one. What I totally love about this oil is the fact that it is completely absorbent. After about 10 minutes of a massage the oil is completely absorbed. It also works as an excellent moisturizer for my hands post the massage :). The packaging is very simple in a snap shut bottle. I like this packaging specially for oils because you can pour just the amount that is required. I bought this at the Beaute Naturelle store as I mentioned earlier. You can buy this variant of the oil at Flipkart also, click to buy the oil here. This 100 ml bottle is priced at Rs.250 and it comes with a shelf life of one year. Of course yes, apart from the fact that it does not contain any mineral oils, I think it very essential for everr mom to use such baby oils for their little ones. Switching over to organic and natural products for their baby should be every mom’s priority. I am certainly going to repurchase this. Say ‘hello’ to soft, supple and nourished skin for your precious baby! Rustic Art Organic Baby Oil is perfect for daily body and hair massage. Rich in the goodness of Olive oil, Jojoba oil, Sesame, Cocoa Butter, Cyprus Rotundus and Herbal oils, its regular use gives a lasting glow to the skin. The enchanting fragrance of organic essential oils, especially green apple, will make it irresistible to adults as well! 100% free of mineral oils and chemicals. USDA-certified organic and natural oils used. This product is 100% free of mineral oil and chemicals. Only certified organic and natural oils have been used in this product. Have you tried the evoke one ? It sounds good; currently I’m using organic coconut oil or organic olive oil that I use in my baby’s food also for her massage. However, since I buy these through iHerb and have to pay customs duties, I was looking for local alternatives. I had two concerns about this: I am not crazy about the plastic packaging- it will possibly leach plasticizers (endocrine disruptors) that would be absorbed through the skin. The thing that is really keeping me on the fence is the green apple scent though: Most scents are chemicals (either of synthetic or natural origin) that are unstudied, and often have endocrine disrupting activities. It is probably not going to be in high enough quantities to cause any real damage, but I still don’t like it. I use Omved Shishu Thailam for my boys, you could try this as well. This is in a glass bottle and is prepared in the Ayurvedic style.